As I have volunteered to do a workshop on Working Out Loud in July I'm thinking more about why it seems to work almost effortlessly. In his book, John Stepper mentions the relationship to intrinsic motivation and its contributing factors like autonomy, competence and relatedness. A long time ago I've written a summary of Bruno Frey's book Happiness that also touches these issues. At that time I was also interested in what the New Economics Foundation nef) released as "The Five Ways to Well-Being". 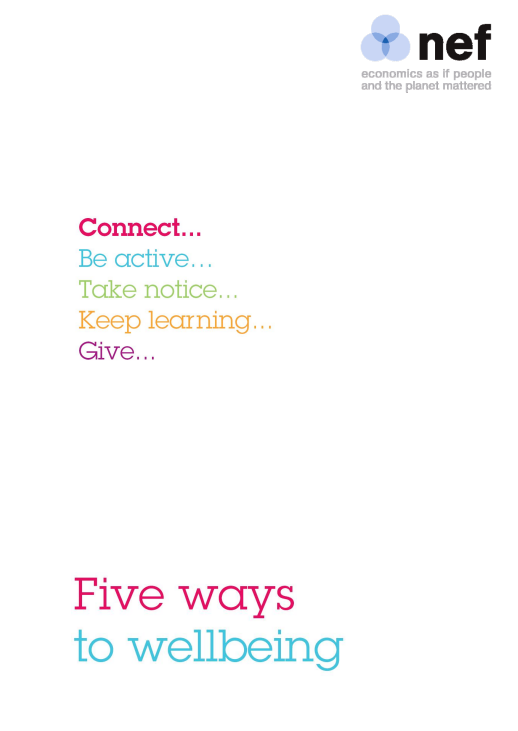 They identified five core activities that contribute to well-being: Connect, Be active, Take notice, Keep learning, Give. Read more about it in the PDF document. Looking back now, I find it interesting that the reinforcing habit loop in Working Out Loud also consists of five pillars. 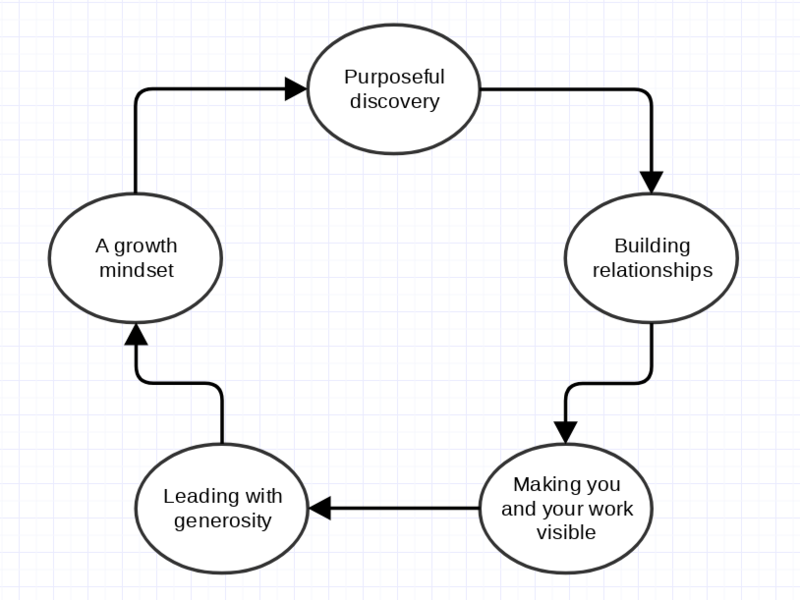 Purposeful discovery is about being mindful and curious, and about choosing the next step or experiment carefully, taking previous feedback and learnings into consideration. Sometimes opportunities present themselves in a subtle way, so it's important to take notice. Building relationships is about investing time in them and developing them. It fits nicely with Connect. Making you and your work visible is about working on your goals and actually getting things done. Be active was meant more in context of physical exertion, but I think creating also falls into this category. 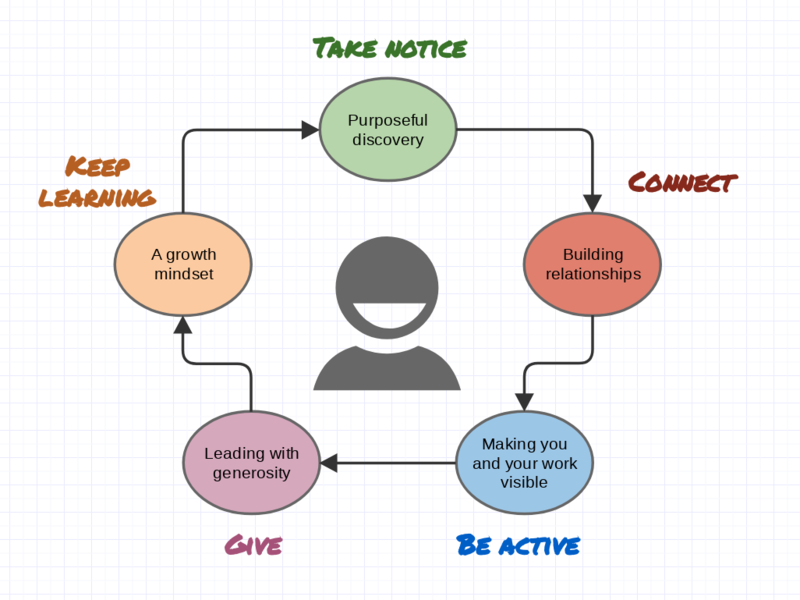 Leading with generosity is about shifting the focus to what you can do for others, and not what can others do for you. I think Give is a natural fit here. A growth mindset is about shifting the focus to getting "better" instead of getting "good". Be bold and ambitious, try to improve and take in feedback. Keep learning is also close to Purposeful discovery, especially because it is about trying something new - as these steps are adjacent, they feel a little interchangeable. Of course this is borderline pseudo-science, but it is interesting to note that each step in Working Out Loud can somehow contribute to a person's well-being. And as Working Out Loud works best if none of the five pillars are neglected, people internalizing the habits have a good chance of living a balanced life, focusing on a set of activities that all contribute to well-being.